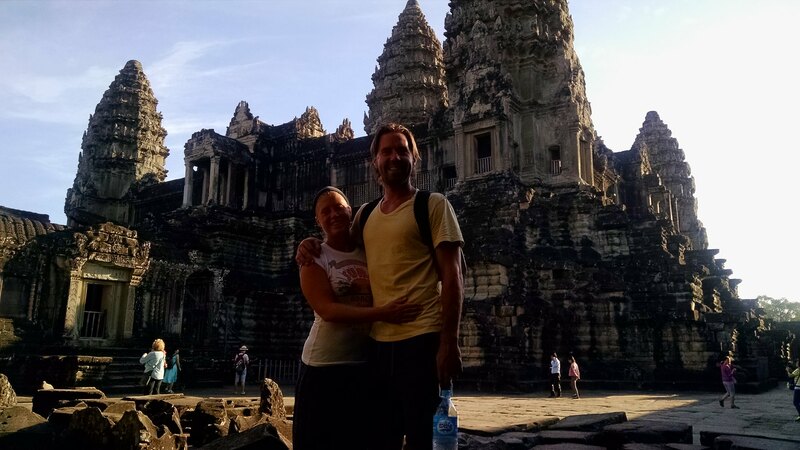 Lindsay and I debated whether or not we should pay a visit to the largest religious monument in the world – Angkor Wat. As you can probably guess from from the title of the blog or some of our Instagram posts we paid a visit. 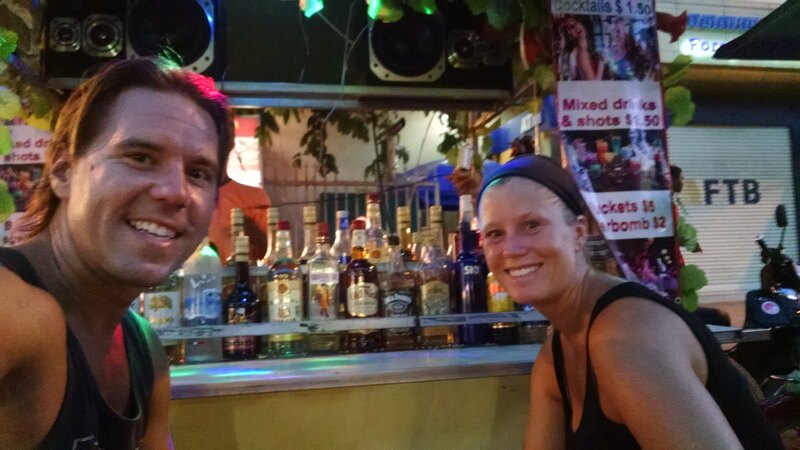 A few of our fellow divers from the Similan Dive Cruise had been to Siem Reap for the temples recently and gave us some pointers. In fact one of them gave us the name of the guide that we ended up using for our tour. It worked out quite well. Jeff: What is Angkor Wat? Lindsay: I don’t know, but I think that we should go. We’re so close. J: Are there more temples? L: Yeah, I think so. People say that we have to go. J: Well if people say we have to go, then we should probably go. Where are they again? L: In Cambodia. Siem Reap I think. J: And what are they? J: OK, we should go. And just like that. Seriously. We booked our flights to Cambodia. It was very willy nilly and we paid the price for how haphazardly we booked this trip. For one, we missed the last two dives from our scuba trip because you are not allowed to fly within 24hrs of a dive and we booked a flight within 18hrs. We also didn’t realize how long it took to get a visa approval letter from the next country we were heading to, Vietnam. 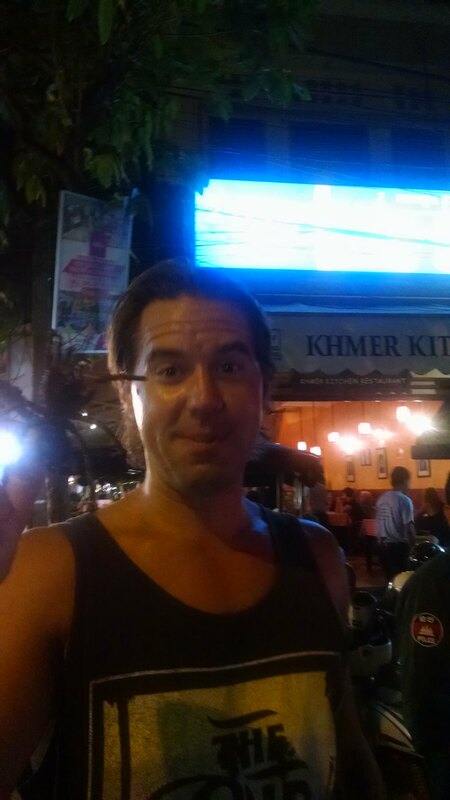 This meant that we had to stay in Siem Reap for a total of 4 nights and we went there for basically a one day tour. Siem Reap is great and all, but really not where I wanted to be for 3 extra nights. We had fun though. Cambodia, from what I could tell by visiting Siem Reap for 4 nights, was the poorest country that we have visited. 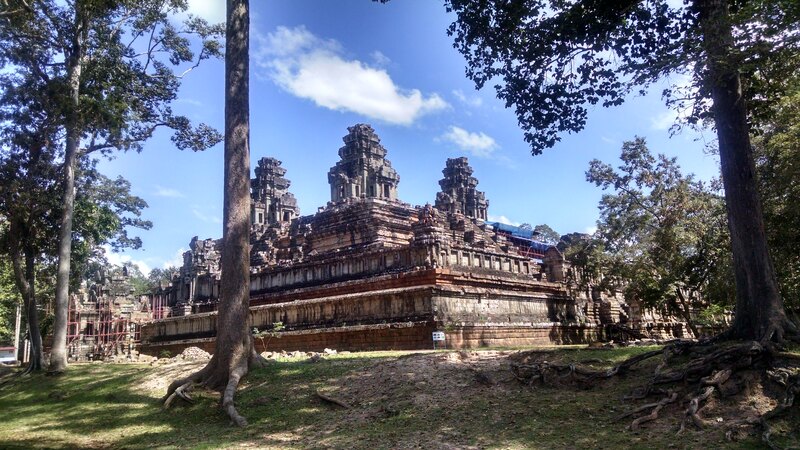 The entire town exists, it appears, solely to cater to the tourists visiting Angkor Wat and the surrounding temples. Shockingly this little town had one of the most vibrant nightlight scenes on their famous Pub Street. Almost every bar in town was featuring drink specials (beers $.75, mixed drinks $1.50) and live music of varying degrees of talent. We thoroughly enjoyed ourselves a couple of nights here. In case you couldn’t figure out that you had made it to Pub Street there are gigantic neon lights at both entrances to the street pointing you in the right direction. Cars aren’t really permitted on the street but keep your eyes peeled for scooters and tuk tuks. 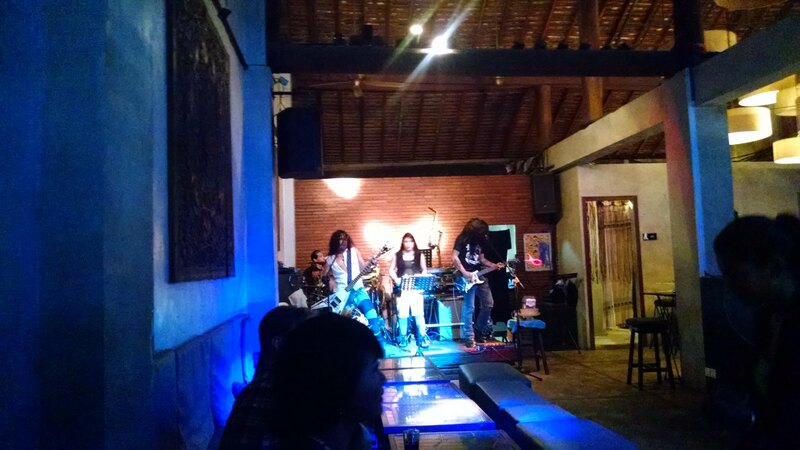 This rock band was pretty dang good. But most impressive was anytime they’d play a (I think) Chinese song some random person from the crowd would get up on stage (without being asked, I guess it’s assumed you can do this) and would sing their hearts out. And they were fantastic. I wondered if it was required to take singing lessons in China or if we just happened to visit several places and by chance their were (what seemed like) professional singers in the audience waiting for their song? Either way it was awesome. You can’t exactly tell with this picture, but we’re sitting in the street where a bunch of 15 and 16yr Cambodian kids setup a bar that they pull around on their scooter and serve just about any drink you can think of for $1.50. We were their first customers this night so they thanked us by making our drinks with an 85% booze-15% mixer ratio beverage. The guys kept laughing and asking us “are your drinks strong?” We kept lying and telling them, “nah, they’re perfect..” These kids were living the dream any 15 or 16yr old wants. 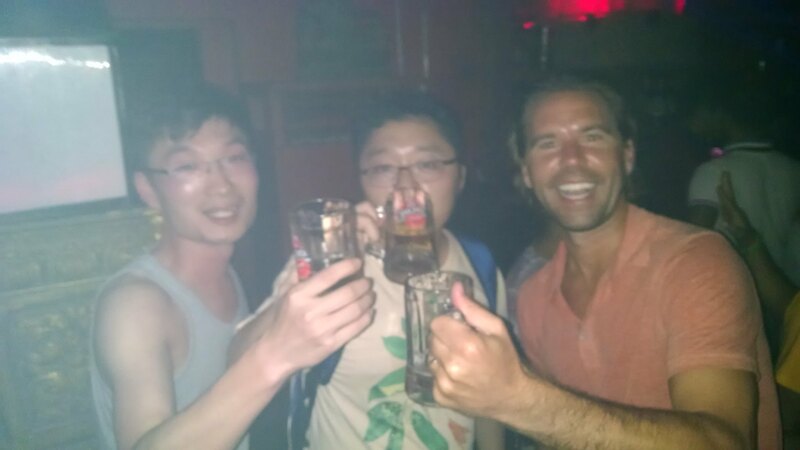 With all of the less than a dollar draft beers, $1.50 knock-you-out cocktails and any time of shooter/bomb/shot you can think of you are bound to meet new friends. These are mine. 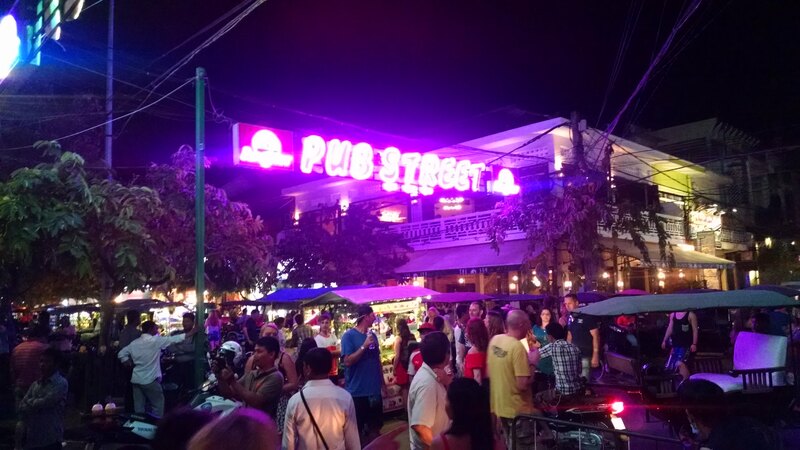 It wasn’t all cheap drinks, meeting new people and eating bizarre insects in Cambodia. We also got our temple on. 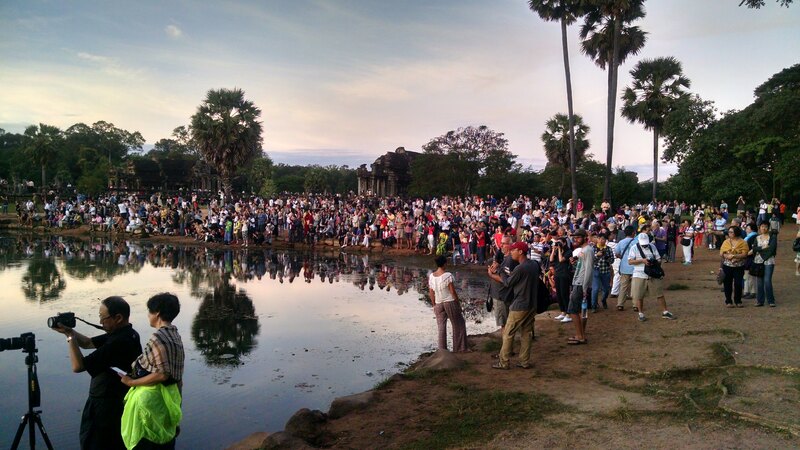 The plan all along had been to view the sunrise at Angkor Wat – the most famous of the Wats (or temples) in Cambodia. Although not the largest, it’s the most well known and often times the entire complex of many temples is simply referred to as Angkor Wat. We visited a handful of distinct temples and areas. Waking up at 4:30am in the morning makes for an extremely long day. We were good kids and went to bed early enough to get close to 8hrs, but still. That is a long day. And the sunrise …well, I don’t know. It was eh. OK. Fine. Definitely not great. Glad that we did it, but wasn’t the boost that I was looking for to propel me into the next 6 straight hours of looking at temples. Our guide was just OK. He spent as much if not more time telling me how hard it is to make a living in Cambodia and how he loves to eat dog (not his, of course because that would be hard to explain to the kids). He was relentless on how he needed both Lindsay and I to review him with 5 stars on TripAdvisor so he could continue to grow his business. I applaud his ambition but the truth was I still had to log onto Wikipedia to write any meaningful information on Angkor Wat for this post. The history is long and confusing. The bits and pieces that I did gather had my head spinning. Some of these places were 1,000 years old – very impressive! But they were once Hindu temples and eventually converted into Buddhist temples. That means there are some portions that are very “Hindu-like”, other portions that were destroyed because all of the Buddhas were forcefully removed and some areas that were very “Buddhist-like” and others that were a very nice mix of both influences as the King that ordered their building wanted to blend and assimilate the communities. I couldn’t follow all the changes – this king did this, then it was Buddhist and they did this and then there was another king and they built this for their sister and yada yada yada. 1,000 years of this. Unlike Machu Picchu, these temples really only served one purpose. They were religious monuments. Once you saw one you sort of saw them all. There are differences, yes – but nothing that required me to closely examine 4 temples over 9 hours. Machu Picchu I think captured my attention because there was so much going on. They way the people laid out their bedrooms and bathrooms in relation to the sun, third terraced farming and irrigation techniques – the unique setting on top of a mountain and the work in progress that can still be seen to imply something sudden and dramatic forced them to stop and never return. None of that existed in Angkor Way. Or at least I am not aware of it. So, without further ado I present to you . . . Angkor Wat!!! This was about our best sunrise picture. There is almost no way to get a great picture without other people in your frame unless you push and shove your way down to the front and then back. Ok, real quick – last rant. Travel writers, bloggers, magazines tend to over-romanticize travel. Angkor Wat, for me, was the most blaring example. 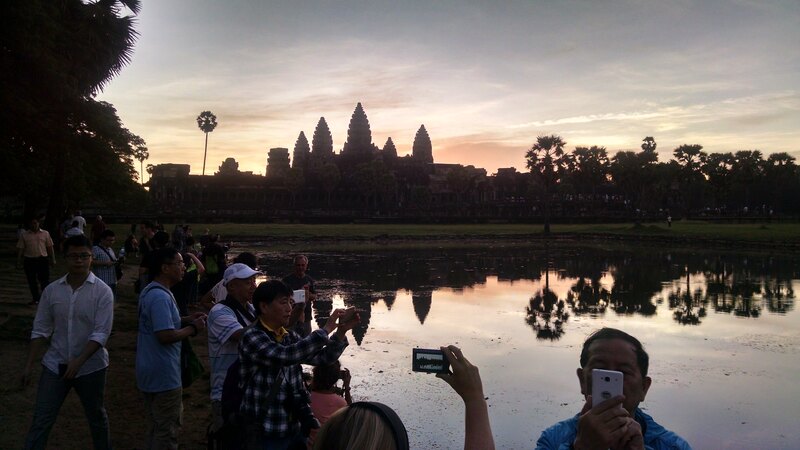 We read things like “Sunrise at Angkor Wat is breath-taking..” or “magical” or a “must-do”. I guess. I took the picture of the temple and the sunrise and then turned around and took this picture. This is what it’s actually like at sunrise. This is why it’s tough to get a good picture. What you don’t see is the constant harassment to buy coffee, buy a book, buy pants, buy shirts, have breakfast, etc.. etc.. etc… I think this experience, our first of the temples…at 6am…set us up for a blah rest of the day. Don’t let me be a Debbie Downer. 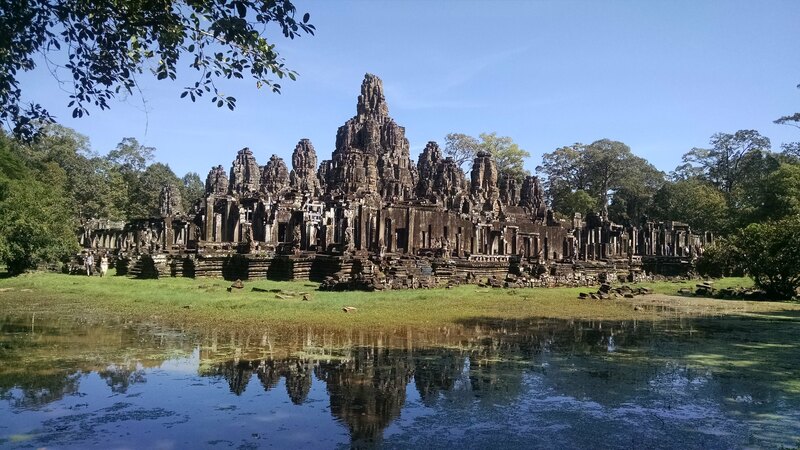 There were plenty of awesome pictures to be had on this day, such as this one just outside of Angkor Wat. The temples themselves are very, very impressive in the spots that have been properly restored. 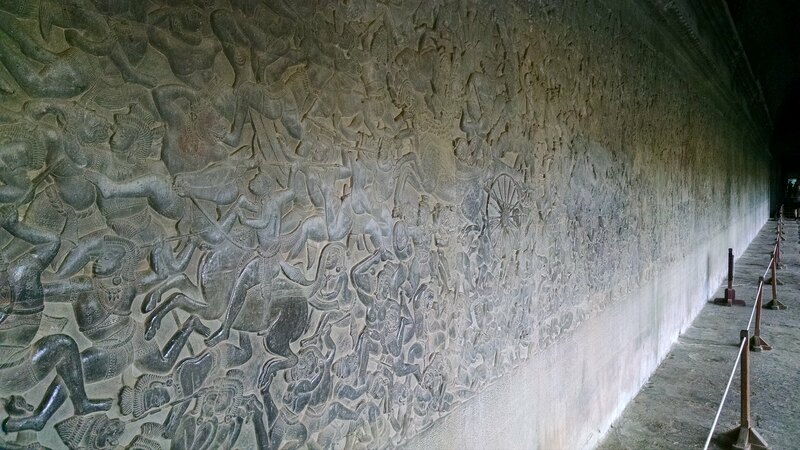 This wall for instance, that stretches further than my camera could capture, was carved by hand. The entire complex took over 100 years to build. Gigantic rocks were delivered from the mountains via raft from over 40 miles away. Quite the feat. Here is an up-close shot of the same wall. The detail is incredible. The entire wall tells a story of the Kingdom’s fight against evil spirits. The mixture of demons and spirits along with reality also made it hard for me to follow what actually happened and what were simply stories. It was told to us like it was all fact. 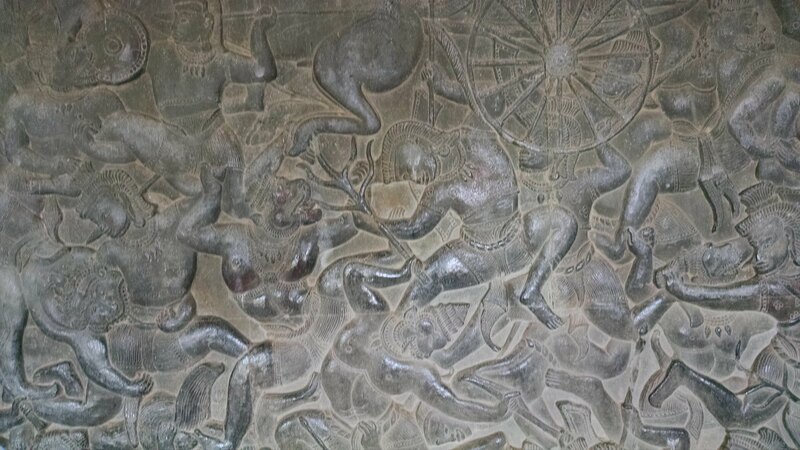 Even the part with the 7-headed dragon fighting the monkey soldiers on elephants back. Regardless, this wall carving was impressive. 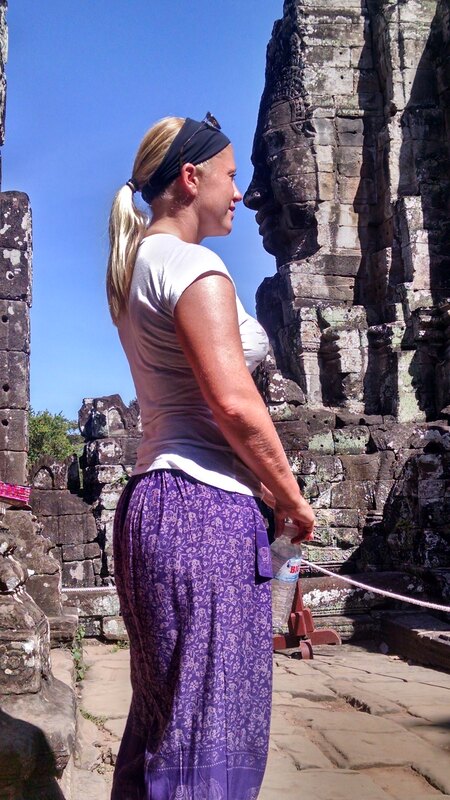 This picture was taken at Bayon – famous for the more than 200 smiling stone faces. Lindsay goes nose to nose with one here. She is also sporting a brand new pair of bright purple genie in a bottle pants purchased within the temple grounds at a clothing store setup to “get” the tourists, like Lindsay, who didn’t wear appropriate clothes. You must cover your knees. This is my favorite picture from the day. Bayon temple from outside with a reflection in the moat. I also really liked this picture with the blue sky and white clouds in the background. Lindsay gets credit for this one. 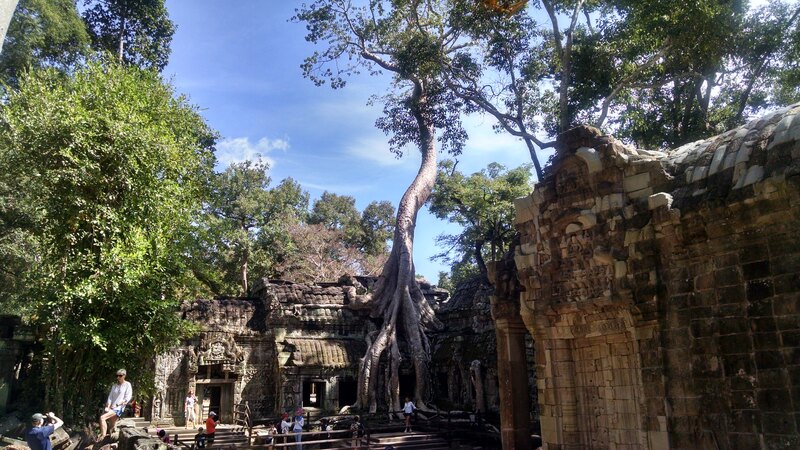 This is Ta Prohm, the last temple we visited. You might recognize it from the hit movie Tomb Raider starring Angelina Jolie that was filmed here. It was a “forgotten” temple for a long time. Because it was forgotten there was no one to take of it and trees, over the last couple of hundred years, have started to grow in and around the temple. This was my favorite temple of them all. Very good to see the trees mixed in. There were plenty more pictures that we took and posted to our flickr album, you can view them below! ← Diving the Similan Islands….on a boat! This was one of the places where there are a lot of pictures of you two together. who took them all? Other visitors or did you have friends there? Ah, very good question. Our driver/tour guide/photographer was really into taking pictures of us. We must have had hundreds. It was really nice actually to get away from the selfies or having to constantly ask someone for a picture.